Dr. Barrister Umar Ibrahim Mantu was born of Barrister Zuwairatu Mantu on April 7, three years after the end of Nigeria’s Second Republic. He is the fourth child of former Deputy Senate President, Senator Nasiru Ibrahim Mantu. He is married to Sa’adiyyah Orobosa Mantu and they are blessed with a son. 4. Best graduating Student in Physical and Health Education and Mr. Corona. Accordingly, due to his brilliance, he was Assistant Head Boy of Corona Secondary School in his year and a Peer Counsellor in the school. Upon completing his secondary school, Umar went on to the University of Reading’s International Foundation Programme, where he completed with a Grade 1 distinction. He went on to do his LL.B Law at the University of Reading, where he obtained a Second Class Upper (2:1) with honours in Law in 2007. While at the university, he was made the President of the Afro-Caribbean Society 2005/06 and also in the University Athletics team. After that, Umar went on to the College of Law of England & Wales (Moorgate) for a Post-Graduate Diploma in Legal Practice (with specialization in general corporate and commercial practice) in 2008. While at Moorgate, he was made the Vice President of the Afro-Asian Society. In 2008/09 he went on to the University of Warwick for his Masters in International Corporate Governance and Financial Regulation. Upon completion, he came back to Nigeria to observe the one-year National Youth Service Corp (NYSC) programme. He served at ECOWAS Parliament in their PARLIAMENTARY AFFAIRS division, where he was involved in the administration of parliamentary sessions. Upon completion of the scheme in 2010, Umar stayed with the parliament till 2011, before he went on a French course at the ACCORD Ecole de Langues, InstitutSuperierPrive, Paris, France where he successfully completed his course. He came back to Nigeria for his one-year study at the Nigerian Law School, and was enrolled at Bwari, Abuja campus, where he was successfully called to the Nigerian bar in 2012. He is a corporate and commercial lawyer, who has served as the Group Legal Executive Director with TSE Group of Companies Limited. Umar has also served on the boards of The Sharp Group Africa, RIZQ International Consult Services Ltd and the Calabar International Trade Fair (CITF). Umar is a member of the Nigerian Bar Association (NBA), International Bar Association (IBA) and the Institute of Chartered Mediators & Conciliators (ICMC); Umar has served as a council member of the NBA Abuja Unity Branch section on legal practice and business law. He was also a member of the Abuja Young Lawyers Forum of the Nigerian Bar Association (Abuja Unity Branch). 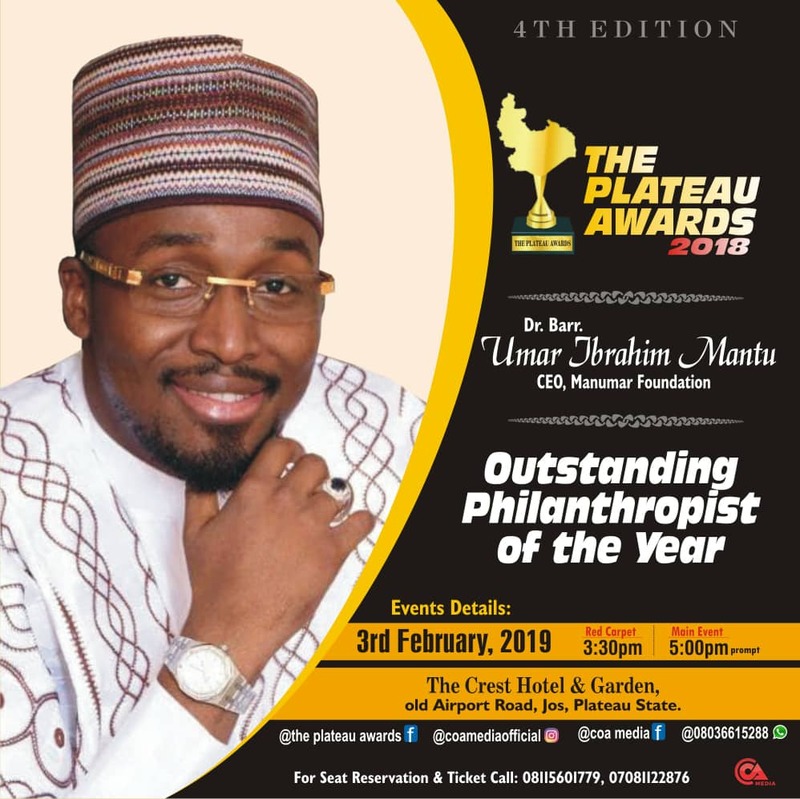 Umar is a member of the Rotary Club of Abuja Federal (RCAF), an international award-winning club, and has served as Polio Chair (2015/16), Director of Vocational Services &Vice President (2016/17), President (2017-2018) and now Assistant Governor (2018-2019). He is a Paul Harris Fellow (PHF) and a recipient of the RCAF presidential award for vocational service and membership development. He is a certified FOREX trader (Level 1) from the Alpha Trading School, London. He holds a doctorate degree in humanities (D. Humm), 2017 from Igbinedion University, Okada and one time federal House of Representatives aspirant for mangu/bokkos Constituency under the People’s Democratic Party platform. Dr. Umar is defined by his principle of lifting others up when they are down. In his social circle, he is known for his humility and perpetual need to help out when required. This innate streak and passion for a better society, led him and his wife to set-up the Manumar Foundation. The foundation is a non-governmental organization committed to enhancing the quality of lives of Africans by supporting initiatives in healthcare, education, sports and community development. In the foundation’s few years of existence, it has achieved a lot in line with its slogan “Investing in humanity”. Umar & the Manumar foundation are part of the World Bank Youth Forum, Youth Matters Initiative (a partnership with the Federal Ministry of Health; One Campaign, Mike Omotosho Foundation, Silver Lining for the needy initiative and other Non-governmental organizations), which is aimed at promoting the awareness of mental illness, sexual abuse and drug abuse. Umar also co-founded the Global African Awareness Initiative, which is aimed at supporting Africans worldwide, while showcasing the greatness of Africans and the African continent. He is a trustee in the ZuwairatuBayero Foundation and Musa Mantu Foundation. Umar is a member of the Africa Development Forum, Nigeria and a youth mentor in the Skills Outside School program, a social intervention program aimed at youth development and empowerment. He is responsible for the giving of the Umar Mantu & Z Mantu Awards to the best graduating students in Government & English Language in Corona Secondary School, Agbara, Ogun State his Alma mater.